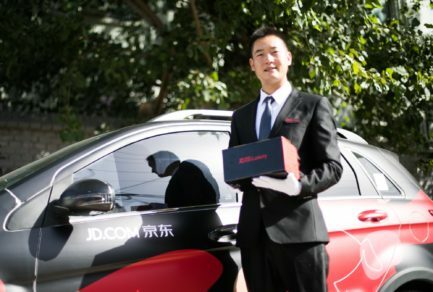 JD.com, China’s largest retailer, has launched new AR/VR makeup features to help customers test multiple cosmetics on their own faces at once with real makeup effects, such as matte and pearl lip color finishes, before buying. The new feature, JD’s “AR Styling Station,” an upgrade from its previous AR makeup platform, was launched at the company’s annual “Butterfly Festival” in Beijing where leading beauty and fashion brands showcase the latest products and industry trends to potential consumers. The festival is marked by a ceremony attended by leading global brands including L’Oreal, SK-II, Maybelline, and Olay, as well as Chinese celebrities. Using the JD mobile app, which is the most popular way for JD’s over 266 million customers to shop, consumers can virtually “try on” products including lipstick, blush, colored contact lenses and eyebrow pencils. Testing makeup has been a pain point for many online consumers given that it’s difficult to judge just by looking at photos of products whether or not they will actually work when customers try them on their own faces. JD’s AR technology not only solves this problem, but also has added features which enable potential customers to share their photos with friends. This in turn helps drive customer traffic and increase conversion rates for brands. The launch of AR Styling Station is part of JD’s broader effort to create cutting-edge and personalized shopping functions for digital-savvy consumers. The technology, which was developed with the help of makeup industry experts, gives consumers the “hands-on” feel of the offline makeup testing with the convenience of online shopping. For the past few years, China has surpassed Japan to become the world’s second largest market in for cosmetics products, just after the U.S. Business intelligence firm L2inc predicts that China will become the largest market for cosmetics products by 2020. Meanwhile, with quality of life improving in China, mid- to high-end cosmetics are becoming increasingly popular. In the last two years, JD has seen an increase in consumers purchasing international beauty brands, particularly as younger consumers are looking for higher-end beauty products. In 2017, the average number of new customers who made high-end beauty purchases increased more than ten times the number a year earlier. To capture the burgeoning online market for high quality international products, JD has launched sales of a growing list of famous global brands on its platfrom, including SK-II, L’Oreal, Clarins, Aveeno, Avene, Marionnaud and The History of Whoo, among many others in 2017. French brands such as L’Oreal proved the most popular skincare brands among consumers in 2017, while Japanese skincare and makeup brands such as SK-II showed the greatest increase in sales from the previous year. JD will introduce about 200 more high-end beauty brands to Chinese customers in 2018. Since the start of the year, Biotherm, Helena Rubinstein, philosophy and Jurlique have already launched stores with JD.